Milk chocolate sea salt caramels. Sea salt caramels are all the craze. A delicious caramel covered in milk chocolate then sprinkled with sea salt. You get a sweet and salty treat all in one. Our milk chocolate sea salted caramels come in a 48 count box. You won't go wrong with these delicious chocolates. 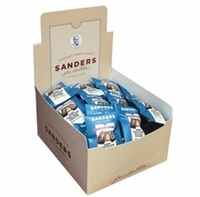 Sanders has been making caramel candies since 1920 and have just recently added sea salted caramels to their line of fine chocolates.